Paria Springs Eco-Community and TIDCO invite tour operators and media to experience Trinidad’s Eco/Adventure offerings first-hand at the upcoming FAM/Media Trip in Trinidad between October 27 and November 3, 2004, throughout the island. Events begin on Wednesday, 27 October, which is when we recommend that people arrive in Port of Spain. 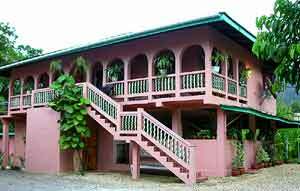 Carnetta’s Inn is a cozy family-owned guesthouse offering comfortable accommodations on the outskirts of Port of Spain, Trinidad and Tobago’s capital. The inn’s restaurant provides splendid local Creole dishes, and the delightful staff are always willing to make your stay relaxing. At 7:45am we all meet to formally introduce ourselves and meet our industry sponsors. Breakfast is served at 8:15am with presentations while eating. We’ll depart at 9:15am and head north out of Port of Spain to Trinidad’s spectacular North Coast. Enjoy fantastic views of the Northern Range as it crashes into the Caribbean Sea. Our adventure begins in the rainforests of this dramatic mountain range. The first stop is on the Marianne River, which passes through a small agricultural community, Avocat, where we’ll park and access the river. Our hiking trail is a circuit over some short hills, where you’ll see and experience the rainforest and its wildlife, firsthand. Highlights include leafcutter ants, termites and beetles at work, while Emperor and other butterflies flit by. Forest birds such as Trogons, Honeycreepers and Manakins are abundant at their leks. 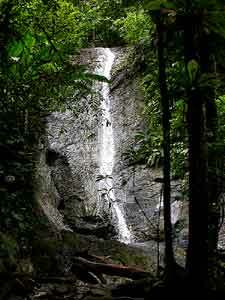 The trail leads to an enchanting stream with an abundance of flowering anthuriums and heliconias on its banks. The walk ends at a gorgeous 70-foot waterfall, where you’ll take a revitalizing swim in the small pool at the base of the falls. Relax while getting a natural drumming massage. The walk is about 1 _ hours in and fairly easy, with an easy 30-minute walk in the enchanting Marianne River through forest on the way out. 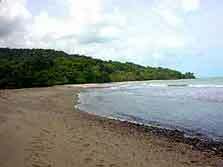 Return to the North Coast to Blanchisseuse. At the mouth of the Marianne River where the placid river waters meet the turbulent waters of the Caribbean Sea, we’ll board either single or double kayaks. This part of the river is tidal and is used by many marine creatures as a spawning or hiding ground. As you glide along, gentle breezes blow around you carrying Swifts and Swallows dashing about collecting insects on the wing. 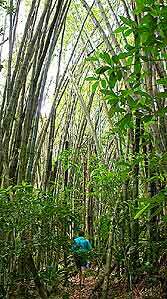 Further into the river system impossibly long bamboos arc over your head spilling into the river. As you navigate around obstacles in the river, Kingfishers, Silvered Antbirds and Sandpipers flit about, Mullet and Gobies swim away and crabs dive into their holes as they see the strange-looking creatures (that’s you) invade their habitat. Traveling deeper into the forest, the river gets shallower as you move from pool to pool and eventually we have to stop kayaking and relax or swim in one of the pools. 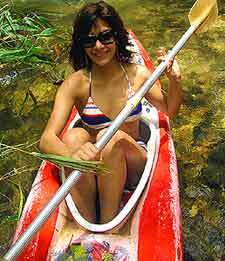 Since the kayak is best at high tide, which varies, we may actually kayak first then go to the waterfall. Attire: Dress for breakfast prepared to go on the tour in Shorts and a T-Shirt or Polo. Ladies can wear their swimsuit underneath; guys should wear surf-style shorts that double as swimsuits. Keep a change of clothes handy so you can change after the hike. High up in the hills on the Northern Range in Brasso Seco, Pena Blanc is a four-bedroom home with a splendid view of the valley below. The wonderful key to this home is that the roof may be rolled off as it used to be used as a cocoa house. (Don't worry – this does not expose the rooms below to the elements, as there is a strong wooden roof dividing the two.) On this wooden roof mattresses are placed for most of the guests. Relaxing with the roof rolled off is an absolutely fantastic way to spend a night. Due to its elevation and location for much of the year there is a constant and sometimes strong breeze through the house, which often makes staying awake a losing battle for many. A highlight will be an absolutely delicious local meal prepared by local Carib Amerindians. Pena Blanc is truly a cultural experience, utilities are very basic as there is nothing fancy here, and you live as locals would. This enriches your experience. Tonight after our wonderful local dinner, we are entertained by a local Parang and Calypso Group. Parang is a traditional form of music that is very lively and has Spanish roots, and Trinidad is the birth place of Calypso. This night is one of merriment. 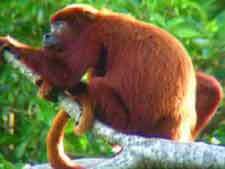 After a 4am departure from Pena Blanc, we head off on a two-hour drive to see the amazing red howler monkeys in the Bush Bush area of Nariva Swamp. As we approach Trinidad’s East Coast we have breakfast in the vehicle, driving through miles of Coconut Palm Trees along the east coast until we arrive at Nariva Swamp, Trinidad's largest freshwater swamp. We enter Bush Bush, which is a flatland peninsula that juts out into Nariva, via Kernahan Trace, a very bumpy road through a farming community. Hiking along a flat trail into Bush Bush one can access the monkey viewing area, where will spend about 5 hours. The Howlers can be found among the branches of the larger trees of the seasonal evergreen tropical forests that dominate this area. Since the Howlers are very mobile, it may take very little effort to see them, or a lot of sweat. Since we are in the forests at dawn, we should hear their amazingly loud calls, which may seem close but actually are some distance off. Getting good views may also mean going off the main trail, tracking them by following their call. We also will be looking for White-fronted Capuchins, much smaller and secretive monkeys that sometimes may be seen eating one of their favorite fruits. This area also offers many other wildlife: birds like the Black-crested Antshrike and Macaws, or butterflies like the Blue Emperor Morpho. After several hours looking at monkeys and exploring, we depart Bush Bush and drive to the northwestern side of Nariva Swamp to a place called Plum Mittan, where we will have a fabulous curry lunch in the home of a local family. Your cultural experience today involves sound, sight, smell and taste. After lunch we head off to Galera Point, where the Atlantic Ocean crashes into the Caribbean Ocean, then ease over to Grande Riverre, where we check in and take a swim in the ocean if you wish. Attire: Long pants or slacks and a T-Shirt or Polo. Light colors are best as this area tends to have mosquitoes at times and dark colors attract them. Keep a change of clothes handy so you can change after the hike. 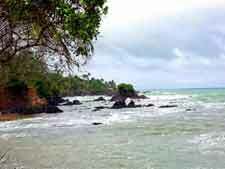 Along the North Coast of Trinidad lies the sleepy community of Grande Riverre. The beach is famous for its nesting sea turtles in this community tied to the sea, where fishing and agriculture are the main occupations, surfing and swimming the main recreation. Right on the beach is Le Grande Almandier, a new guesthouse built by community members Cyril and Wendy. All of the rooms are colorfully decorated in Caribbean style with hammocks and batik curtains. It also has a restaurant and bar along with a balcony to relax in a hammock sipping rum punch. Chef Jason serves up wonderfully presented, mouth-watering local Creole dishes. (Here fresh fish means it was caught about two hours before.) Wendy presents the desert: Le Grande Almandier Cheesecake topped with fresh almonds from the trees outside the restaurant. Attire: Casual at dinner and for the evening beach party. If attending the competition, dress as if going to the beach. If hiking, wear long pants or slacks and a light-colored T-Shirt or Polo. As with Saturday you have the option of being taken out on a tour in the area to waterfalls, or sightseeing, or just relaxing on the beach. Today there will be several mountain bike races that you may join if you wish, either to try and win, or just to do as a biking tour. Also you will want to spend some time at the Adventure Festival. The grueling cross-country race starts in front the judges’ stand in Beach Break, Sans Souci, and goes up to Monte Video mostly along the main road. For this year’s race we will be adding a new trail on the way to Monte Video. Once past Monte Video, racers turn onto the Monte Video Zagaya Trace, a tough muddy trail that goes through the back of Grande Riverre Valley, crosses the river and climbs a steep hill, and finally descends sharply into the bay west of Sans Souci. 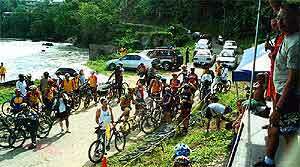 Racers then turn back towards Sans Souci via the Paria Branch Trace, which starts in a steep, rocky climb and then becomes a narrow undulating trail with several stream crossings, fallen trees and lots of mud, testing the rider’s hill climbing ability, balancing skills and endurance. The competitors’ odyssey ends back in front the judges’ stand in Beach Break Sans Souci. The Downhill Race is exactly that, a race starting at about 275 meters above sea level on La Pas Trace between Sans Souci and Lanse Noir, where the fastest one to sea level wins. Basically the competitor who uses their brakes the least will win. However, on the way they are faced with slippery rocks, difficult sharp corners switching back on themselves, steep bumpy wet hills, river crossing and jumps. This type of race lends itself to a special type of bike that has both front and back shocks. It’s a fast and exciting race lasting about 5 minutes and it is one-of-a-kind for the Caribbean. Sheldon Weeks, the 2003 winner, is this year’s favourite as he beat the others so convincingly last year in a time of 3 minutes and 5 seconds. Attire: Casual at dinner. If entering the competitions, wear cycle shorts and top. Our day of adventure is spent in the Grande Riverre River. 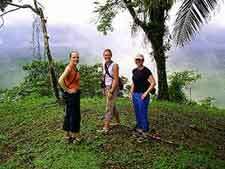 We start walking up the river through agricultural lands and into rainforest. Here amazing butterflies, toucans, lush trees and nature welcome you. Enter the refreshing waters of the Grande River and float, hike and swim your way to the beach and back to Le Grande. 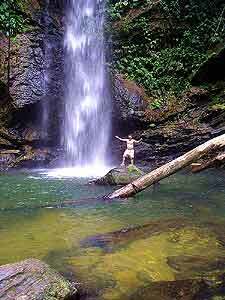 If you are fit and want a tougher adventure, we then hike for more than 2 hours through the forest where we enter a small gorge, climbing over waterfalls pool to pool. Then we return via the river where we climb over massive boulders, jump off waterfalls, swim long pools navigating down the river for about four hours before returning to Le Grande. The return is about 4 hours of serious adventure fun. Attire: Casual at dinner. For hiking, wear swimsuit/shorts. After packing and a quick fruit platter, we depart at 9am for Esterel Spa, where we tour the facilities and take brunch. 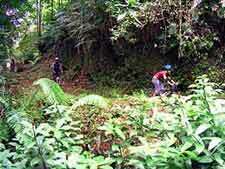 At 9:30am, we head for Mount Tamana, which lies on the eastern edge of the Central Range, south of Sangre Grande. It rises to a height just over 1000 feet and geologically it is unique in Trinidad as it is mostly made up of ancient reefs uplifted from the oceans. After many millennia out of the oceans, running water has carved intricate cave systems within the calcium carbonate left by the reefs. These caves are now the homes to many wonderful geckos and other critters, but their most abundant inhabitants are millions of bats! After a long but beautiful drive through east and central Trinidad – passing many farms, rural communities and lowland forests – we reach Tamana. The trail starts off quite steeply, and when muddy can be difficult to negotiate, but the cave can be reached in about 30 minutes. If we arrive early, we’ll head up to the summit where wonderful views of the Northern and Southern Ranges may be seen. At the cave we can enter and do some exploring as thousands of bats fly around. It is a wonderful experience. Entering the first chamber can provide amazing and close-up views of these incredible creatures. The adventurous can wriggle through the small hole that connects the first chamber to the rest of the cave system. Then go exploring! This will bring you into contact with many bats and other creatures that live in the cave. 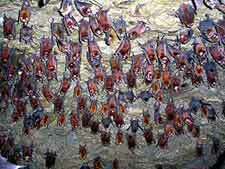 We then wait at the cave entrance until the sun sets, which is when millions of bats depart the cave. Stand at the entrance as a “river” of bats stream past you, producing a unique and exhilarating experience. Here you can feel the wind of their wings as hundreds flutter past, and now and again one may land on you for a few seconds. At about 7pm we head off down the hill, with flashlights guiding our way back to the vehicle. Then we will drive to Chateau Guillaumme, where we arrive around 9pm. Attire: Long pants or slacks and a T-Shirt or Polo that you do not mind getting very dirty. 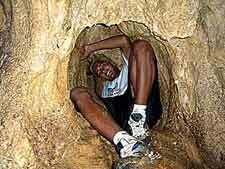 Keep a change of clothes handy so you can change after the cave exploration. Courtenay is a naturalist/adventurer and Managing Director of Paria Springs Eco-Community. His love and knowledge of nature, hiking, mountain biking, surfing, diving, birding and adventure make him perfect to be your lead tour guide. Many of the trails you will take, he pioneered for tours and local nature enthusiasts alike and will lead you through your adventure with his easygoing love of life. 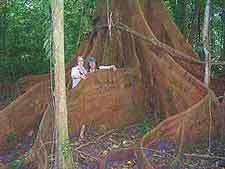 The desire to develop ecotourism in Trinidad and Tobago has been fuelled by the fact that Courtenay has been hiking through and studying the various habitats of Trinidad and Tobago for more than 20 years with his family, the Trinidad and Tobago Field Naturalists’ Club (of which he recently resigned as Secretary), and while working at Institute of Marine Affairs of Trinidad & Tobago. During this time he gained a respect and love for these environments, and a wealth of experience. He is also an avid naturalist, ornithologist and nature photographer. Serious study of birds started in 1985 and he is the founding Chairman of The Field Naturalists’ Bird Group. Courtenay has been surfing since 1978; mountain biking and adventure racing have come more recently but are his current focus. Courtenay started the Paria Springs Project to answer his desire to have a career that while providing an income allowed him to work with rural communities and conservation. In order to achieve this vision, two organizations were formed: Paria Springs Eco-Community, which handles the business of ecotourism, i.e. lodging, tours, transfers, etc. ; and Paria Springs Trust, a non-profit NGO whose aim is conservation and gains its funding through grants or donations. The Trust’s lead project is the Ocelot Conservation project, which has education, advocacy, research and conservation components. Ivan is a former racing cyclist turned anything-on-a-bike guy!! He can make your tour a joyful experience, as he is a fun person to be around. He provides a unique view on being a Trinidadian who loves a party or in Trinidadian language “Liming”. His current passion for racing has been focused into adventure racing and duathalons. Cristo is a man of many contradictions – Shaman of the Carib community (local Amerindians) and a Roman Catholic. His local experiential knowledge of Trinidad’s Northern Range is unsurpassed and paralleled by his knowledge of Trinidad’s culture through the eyes of the Caribs. He is your adventure-hiking guide in Trinidad and is also the lead singer of a Parang Band (a local type of music using four-stringed guitars) that at some time will entertain you. Owner/Operator of Undersea Tobago, Derek is arguably Tobago’s leading diving operation. Derek has been a Dive Master for more than a decade. There is not a nook or cranny in Tobago that he has not dove and his staff are just as capable. 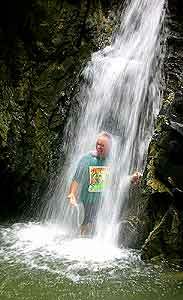 Sean is an enthusiastic sportsman who knows/loves the best and most exciting trails around Tobago. Known as "The Iceman" (he operates his own ice factory and approaches the most hairy trails cool as ice), Sean formed Mountain Biking Tobago to legitimise his habit of disappearing on his mountain bike whenever he had a spare moment. His passion for outdoors activities include mountain biking, surfing, adventure racing, wind surfing and kayaking. 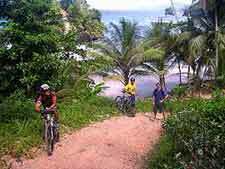 This makes him the perfect guide for our mountain biking Tobago experience. David is without a doubt Tobago’s foremost natural historian. Just when Courtenay thinks he knows a lot, he just does a tour with David (his Dad) and he realizes who is boss! David has studied the natural history of Tobago for more than 50 years, and his enthusiasm to conserve it has made him the founder President of Environment Tobago and a very vocal conservationist. He has been featured as an expert on several wildlife documentaries and provided technical information to the very famous David Attenborough’s “Trails of Life”. David pioneered ecotourism in Tobago in the early 1980s and all of the standard trails were forged by him, and by many of the guides he trained. Sheldon is an Adventure Guide in training and now Courtenay’s protégé. Sheldon will ensure that the tour runs smoothly and are fun. Camera with plenty of film and spare batteries advised!